Black Ice Software - Document Converter Server version 1.27, BiBatchConverter 4.33 and Print2Email 10.09 are released! 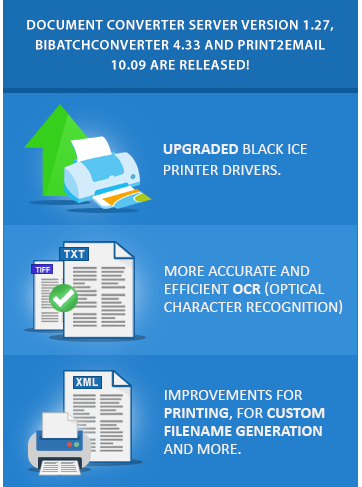 Featuring an updated Printer Driver with significant improvements for Optical Character Recognition (OCR) and more! Black Ice Software has released the Document Converter Server version 1.27, BiBatchConverter 4.33 and Print2Email 10.09. The latest versions include an upgraded Black Ice Printer Driver featuring significant improvement to the OCR module to provide more accurate and efficient conversion of typewritten or printed text into editable text files. The upgraded Printer Drivers also improved printing to Editable XML file formats and printing from the BarTender application. Additionally, the upgraded Black Ice Printer Drivers received further improvements to the Custom Filename Generation feature and updated manuals to enhance the user's experience. Download the Latest Document Converter, BiBatchConverter and Print2Email!